I’m not even sure I said a goodbye to anyone. I was home within 8minutes and within 20mins I was all ready to leave for the Purbecks, Dorsets sacred rock fishing Mecca, and what’s becoming a second home to me. Steve Harder stopped on route from Southampton and we were off. The concrete and noisy traffic soon faded into a distant memory as we drove through some of Dorset’s most spectacular rural scenics. It’s funny how you leave a town or city, and any stress or aggravation stays there. I think that says a lot about life and the choices people make in contrast to our original purpose and existence. The day had been an absolute cracker, hardly a cloud in the sky and beaming sunshine. The walk was a long one, uphill and down dale, but that didn’t phase me, as I was running high on enthusiasm and hope from last Sunday’s session, and the double figure eel I’d caught while cliff fishing. There was plenty of banter on the way. What I love about Steve is the fact he expects to catch something decent every outing, and most of the time he does. 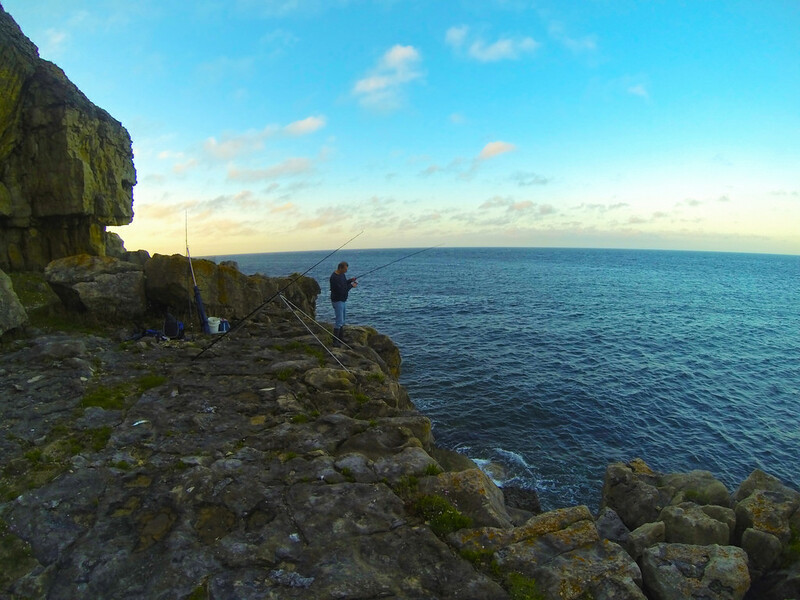 There isn’t much he hasn’t caught over the years, having spent a lifetime successfully match fishing and being the Alderney Angling Festival’s top UK Angler on 3 occasions, he knows his rock marks and you have your work cut out to beat him. After a bit of a climb and a careful look out for adders, I was setting up with the sun low in the sky. I met some Norwegian fishermen on Kvaloya, 400km inside the Arctic circle while snow camping and photographing the Aurora Borealis last winter. 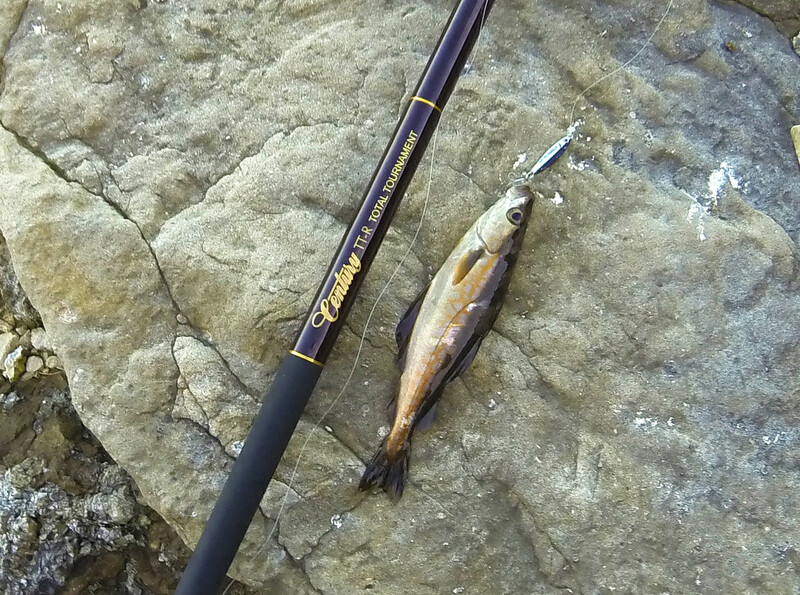 One of them (Jonas), was kind enough to give me this tiny lure that he insisted was dynamite for Pollock. I gave him the rest of my frozen blacks, which I insisted was TNT for Dabs (which they call sand Flounder), I also threw in a Dexter Wedge to try and even up the trade. It was the first time I’d attempted using this lure, I cast about 90 yards my Century TTR with the lure trailing off the back of a 6oz lead. First cast and my first Pollock of the day. 2nd Cast and I had another Pollock. I thought this is childs play, they are absolutely irresistible to Pollock. A few moments later Steve had his first fish, a Garfish, and then another Pollock to me, I also dropped 2 others. 3-1 up I was winding it up a little bit with Steve, it certainly got him into gear. I exercised the old Chinese proverb “never outshine the master”. I put the lure away and geared up both Century TTR’s with big baits, hoping for a sizeable Bass at dusk, to further extend my lead. 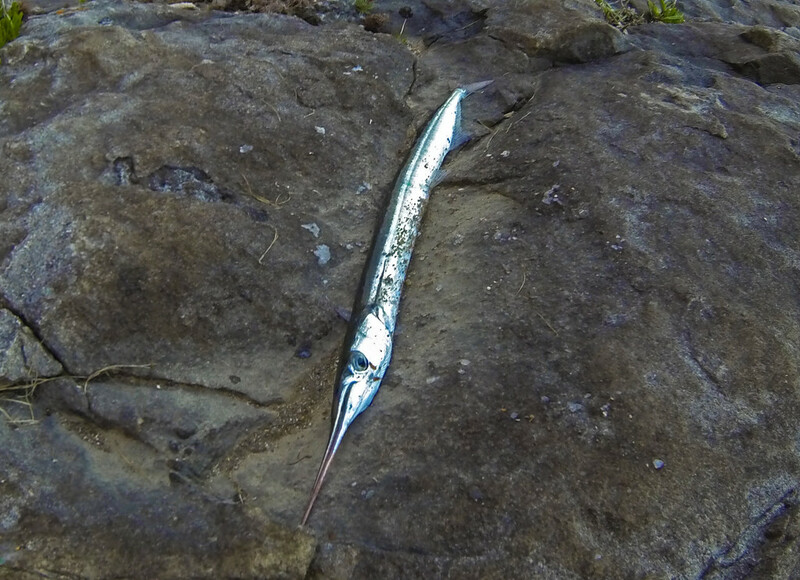 Steve continued to pull in Pollock until he had 5 or 6, using tiny Sandeels. I cast both rods about 80 yards, with a Mackerel head and guts one rod, and the remaining 3/4 of the Mackerel on the other. I bent down sorting my rigs out quickly, then I almost jumped out of my skin to the loudest scream of a ratchet I have heard. Thankfully before striking the bite I realized an Oyster catcher had flown into my line. Luckily it freed itself a moment later and flew off. I was relieved, as that could have been a very messy, complicated scenario. I remember my father catching a Herring Gull once, he told me to get in there and sort out the line on Mudeford Quay, what a job that was in front of a crowd of tourists, all the giant bird wanted to do was peck me. After dark the weather gradually began to deteriorate. What was a short neap sea, became a big angry sea. 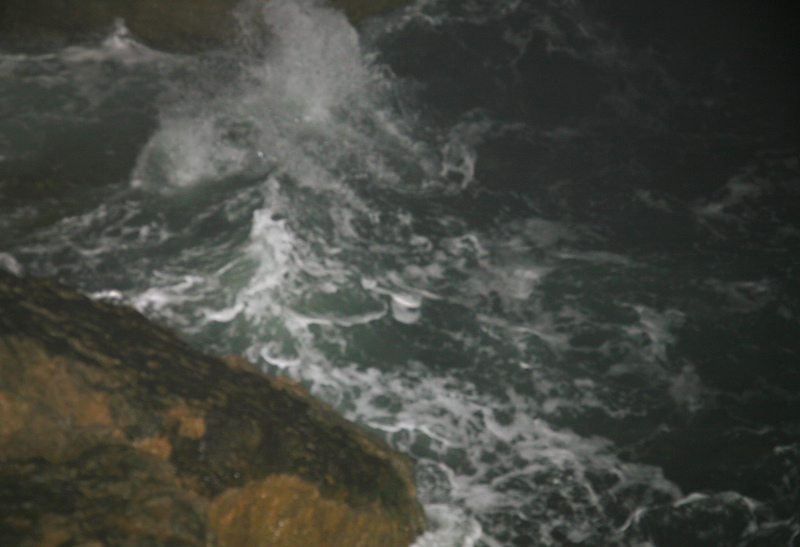 ebbs, squalls, huge swells and surf began to pound the cliffs, resonating with a deafening thud, that shook the land. I’d really underdressed for fishing in this weather, and I was cursing leaving my flotation suit at home. When I thought things couldn’t get worse, then the rains came hammering down. I wasn’t fully waterproofed, and had that cold shiver down my spine, which culminated in goosebumps as I stared into the darkness. It’s a bad state of affairs as an angler when you are tensing muscles to keep warm, or doing more regular bait ups that usual just to keep moving. These swells just got bigger and the tidal pull stronger. I had 7oz grippers on by now, and my rods tips were bouncing with every wave that swept through. I was losing rigs and leads every cast, as was Steve. 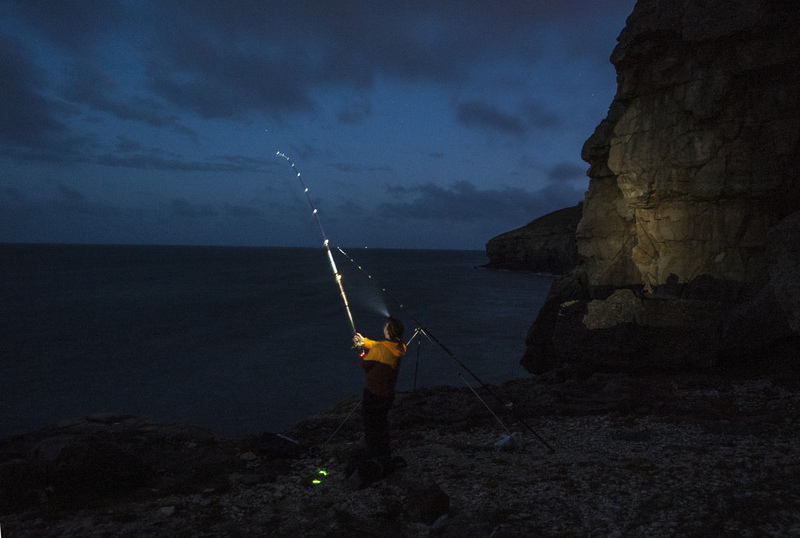 The westerly crosswind was making this night fishing a real challenge indeed. I kept spotting a mouse that was trying to steal my bait, eventually he got close enough to photograph, I could have almost picked him up, but didn’t want to put him through the trauma. He certainly was much more pleasant company than the spectres above me. 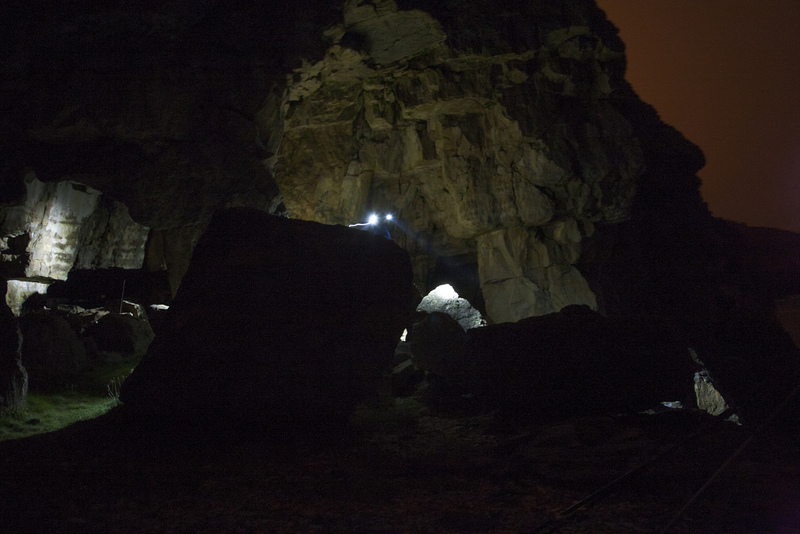 Bats that were darting in and out of the caves ominously. 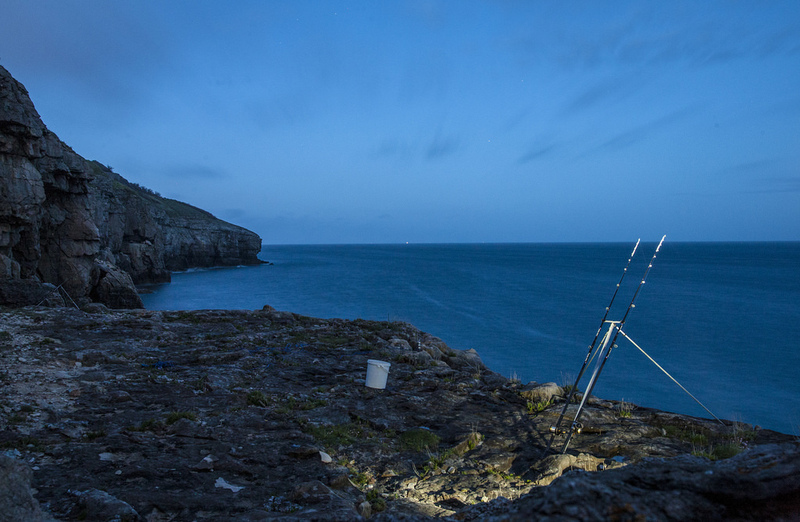 I say it time and time again, but I always feel on these stormy nights, an angler will be rewarded for his endeavours, that the sea may just throw up something special for those who believe it. So many anglers take a look at the weather and say “I don’t fancy that” and settle for a night in hypnotised by TV. I guess I’ve never really gotten over a huge Bass I lost off the side of Bournemouth Pier, in a fierce gale and torrential rain one October, it broke my heart and I was haunted by it for months. In fact whenever there is a decent south westerly blow and low pressure, I always regret not fishing and wonder what could have been. 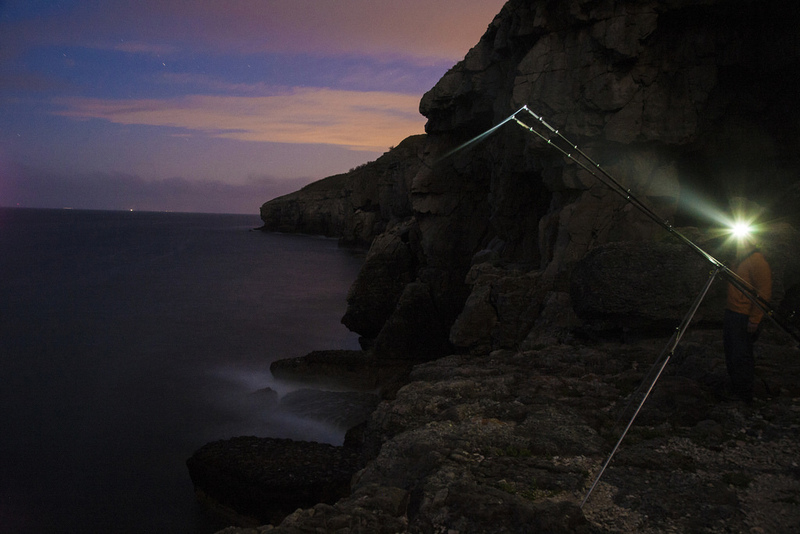 As the wind whistled and howled through the caverns behind me, I watched my rods like a hawk, hoping for any movement outside of the tidal interruptions. Then completely out of the blue Steve shouted at the top of his voice “I’m in…”. 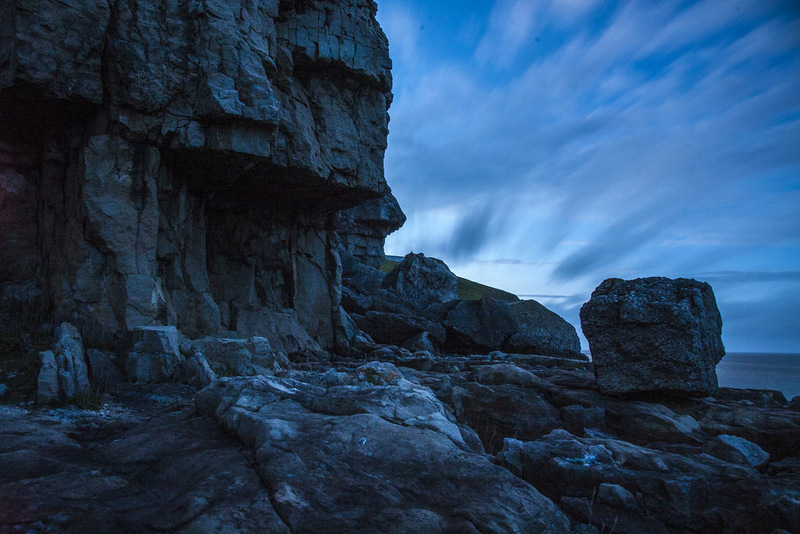 I dashed the 75 yards across the rocks to where he was, and it was action stations. 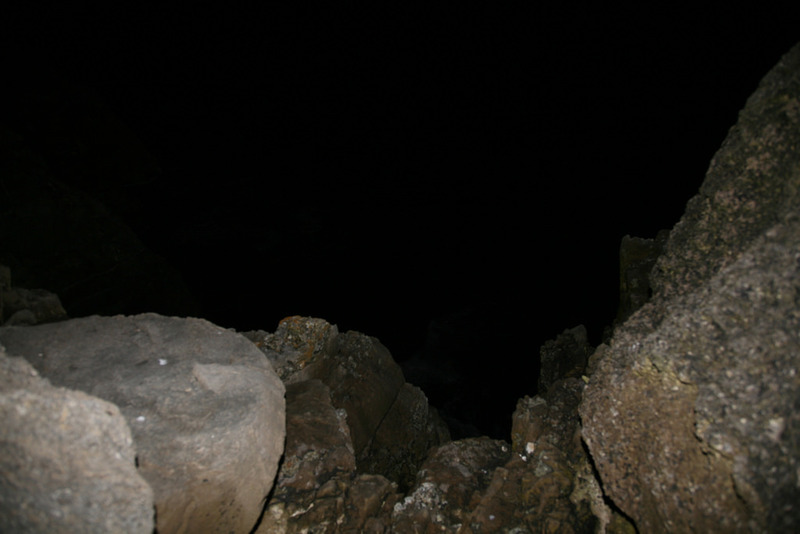 Stood at the edge of the precipice, the two of us shone our LED Lenser head-torches at the ferocious sea. 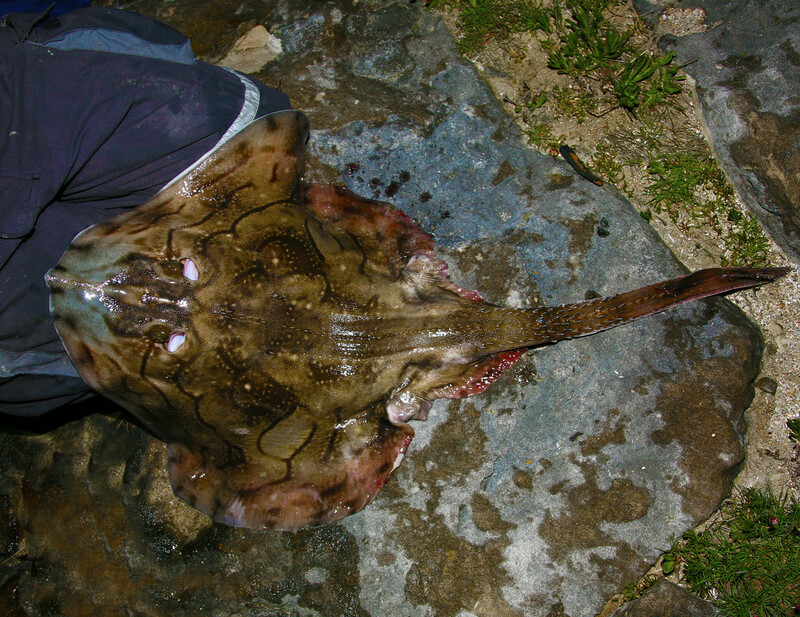 I was betting on an eel as was he, but we suddenly got a glimpse of the most magnificent creature, an Undulate Ray. It must have been 30 yards or so out still. Steve gradually worked it in toward the cliff and handed me the Century Vectra (his favourite rods, he swears by them off the rocks). 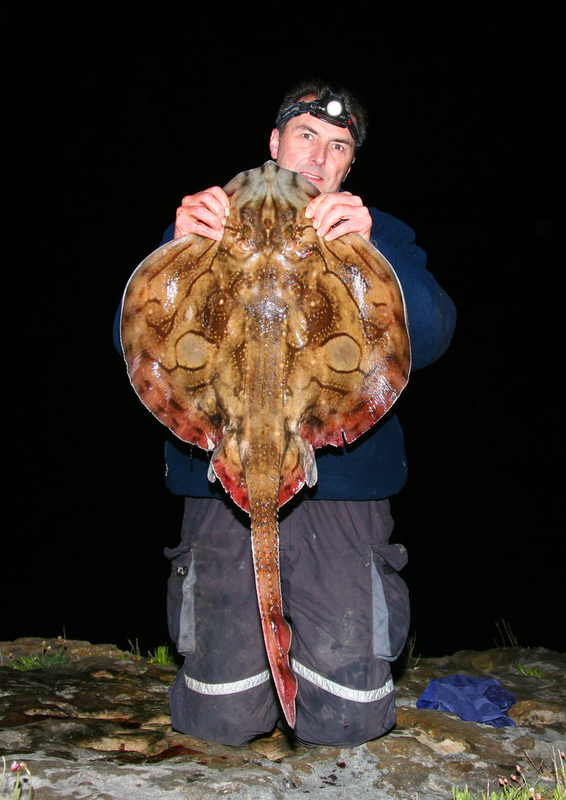 I was there with this Undulate in my grasp as Steve grabbed the dropnet. All I needed to do was hold the rod out away from the cliff. At first it wasn’t that bad. I took my mind off the 40ft drop to oblivion below me, but with the wind and swells, they were making this a nigh on impossible job with the dropnet. This went on for 5-10mins, time was drawing out like a blade, the fish kept diving and every muscle and ligament in my body was burning. It was like Saturday nightwith the eel all over again. I switched rod positions several times, words probably won’t really give you an idea of what this is like, but i’d say it’s a cross between bicep curls and carting wheelbarrows full of roof tiles back and forth on a building site. Most people who reel fish in on shallow beaches, only really notice the weight of the fish when they have it on dry land. When rock fishing from a decent height in swells, as soon as the fish is on the surface, you have a real battle on, particularly as the wide circumference of Rays provides suction and more resistance to waves. Undulates also love to dive, the last think they want is to be on the surface where they are vulnerable. By now, I was well aquatinted with lactic acid and my teeth had been gritted for a while. However, the pressure of losing Steve’s fish was spurring me on. I am not sure any apology would cut it, if the fish was lost and it was my fault. I lost an Undulate 8 months ago from a similar height, it wouldn’t go around this rock and line was touching cliff, there were 3 of us trying all we could to land it, with it on the surface for over 10mins. When the line finally went, I didn’t speak for an hour, just inconsolable. I was fishing with my brother and Alex, who said “You didn’t lose that fish tonight, we all lost that fish”. Anyway, I wasn’t about to go through that with Steve. I was a bit worried about him going over the edge, but eventually he shouted “I’ve got it”. I instantly loosened the drag on his Daiwa SLX40HV in case of any accidents and the fish was up on the deck within 30 seconds. What a beautiful creature, to me there are not many more beautiful things in the sea than this. It weighed 14lb 10oz and the colours and patterns were striking. We quickly photographed it, and released it back in the sea within a moment or two. To be honest, it had all been worthwhile, fishing the bad weather, chancing a neap tide, just with a glimmer of hope that we’d see a fish like this from the shore. Magic. I learn something everytime I fish with Steve, I think unless you fish with someone better than you, you never really improve, it’s the same in any sport. After putting up with as much banter as I could take, Steve told me he caught it on Cuttlefish, a bait I didn’t have with me. I should have picked that up earlier by his blackened hands. He kindly gave me a bit and I was legging it off back to my rods (which thankfully were still there). I whacked out 2 fresh baits as far as I could and stood there hoping I’d be blessed with something similar. It was2:30am, I had work at 9am, but my only priority was baiting-up and casting. Part of me was thinking this is a one fish spot, not a place you catch multiple doubles in a night, but I still stayed optimistic. But at 4am I’d called it a night, we packed up and were off on the climb and hike back. Again I saw 2 deer on the way home. I was in bed at 5:15am. Another memorable adventure had been concluded. Great fishing Steve.